Movado is a Swiss luxury watch company whose name is Esperanto for "always in motion". 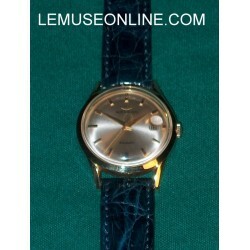 Movado was founded in 1881 in La Chaux-de-Fonds, Switzerland by Achilles Ditesheim. The company was purchased by arts enthusiast Gedalio Grinberg of New York in 1983; his son, Efraim Grinberg, is the current Chairman and Chief Executive Officer of Movado Group, Inc. The North American President of Movado and ESQ by Movado is Alan Chinich. The company is known for its iconic Museum Watch which is defined by a single gold dot symbolizing the sun at high noon, the hands suggesting the movement of the earth. The original Museum Watch was the first wrist watch to be displayed at the Museum of Modern Art and was designed by the American designer Nathan George Horwitt in 1947. Edward Steichen, the renowned photographer and director of the photography department at New York's Museum of Modern Art, proclaimed Horwitt's design "the only truly original and beautiful one for such an object". Movado commissioned the design and installation of "Time Sculpture". This unique clock sculpture was designed by world renowned architect Philip Johnson. It is located outside Lincoln Center in New York City. 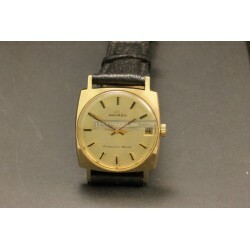 In 2006, Movado celebrated its 125th year of watchmaking. Movado Group, Inc. designs, manufactures, and distributes Movado, Ebel, Concord, ESQ by Movado, Coach, Hugo Boss, Lacoste, Juicy Couture and Tommy Hilfiger watches worldwide.NB WE REMIND YOU THAT A LOT OF OUR WATCHES ARE SOLD BY US FOR OUR CUSTOMERS...THIS MEANS THAT IF YOU WANT TO COME IN OUR SHOP TO SEE ONE OF THEM YOU HAVE TO CONTACT US TWO OR THREE DAYS BEFORE IN ORDER TO LET US TO HAVE THE TIME TO BRING THERE THE WATCH! Movado There are 8 products. 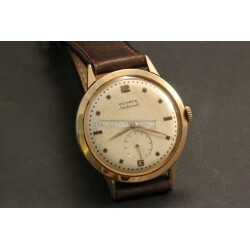 18kt yellow gold case ( size 29mmX27mm ) Automatic movement caliber 388 Black leather strap Champagne dial With date Plexi glass Reference 389-215-518 Made in the '60s Rare model Very nice conditions! -18kt red gold case ( diameter 34mm ) -Hand winding movement -Brown leather strap -Rare original gold buckle -Wonderful original dial -With triple date calendar ( date, day and month ) -Plexi glass -Reference 4823 -Made in the '50s -Rare model -Very nice conditions! 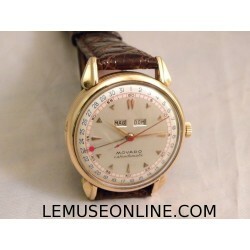 18kt rose gold case ( diameter 35mm ) Automatic movement Brown crocodile strap Plexi glass Wonderful dial! With complete calendar ( date, day and month ) Reference R6230 Made in the '60s Wonderful conditions! Steel case ( diameter 33mm ) Hand winding movement caliber M90 Black crocodile strap Wonderful original aged dial With chronograph Plexi glass Reference 1015 Made in the '40s Rare model! Very nice conditions! 18kt red gold filled steel case ( diameter 33mm ) Automatic bumper movement caliber 223 Brown crocodile strap Wonderful original dial customized for 'Tiffany&Co.' 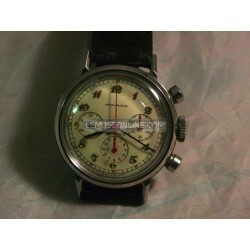 With complete calendar ( day, date and month ) Plexi glass Reference 16352 Made in the '50s Very nice conditions! 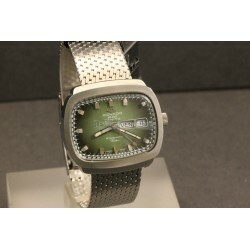 Steel case ( size 39mmX34mm ) Rare original steel bracelet Automatic movement caliber 405 Beautiful green dial With day and date Plexi glass Reference 405-705-591 Made in the '70s Rare model made from Movado in collaboration with Zenith! New old stock really never worn, it still has its protective varnish on the back! 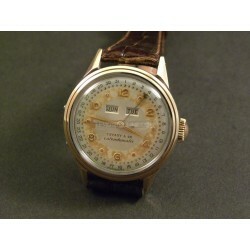 18kt rose gold case ( diameter 37mm ) Extremely rare automatic bumper movement caliber 115 Brown leather strap Small seconds Plexi glass Reference 8454 Made in the '50s Rare model with an oversize case Very nice conditions!